KayKiSpeaks.com: Beyonce Is Working On New Album! Yes Yes... its about that time again. Yall thought Bey could sit out for that long?? Not the hardest working chic in the game! Kanye's super producer S1 let it leak on twitter a few days ago that he is in fact working with Beyonce on some smashes! S1 or Symbolyc One is the producer behind Kanye's "Power"! Can you imagine Bey's vocals on a beat that hard?! Sheesh! Read more to see his tweets! 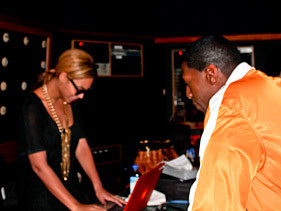 @SymbolycOne: Day 5 with Beyonce again. Trying to finish these production/song task up. Everything is sounding really GREAT and BIG!!!! @SymbolycOne Praise the Lord I made it back home safely! Had a great 6 days in the lab with Beyonce. INCREDIBLE music we made. I for one cant wait!